A couple of weeks ago I mentioned how much I love doing yoga on the beach when I am up on Cape Cod for the summer, it’s quiet, peaceful, relaxing – you can barely imagine a more perfect setting for an early morning yoga practice. Well, today to celebrate the Summer Solstice I did yoga in the most OPPOSITE place you could think of. 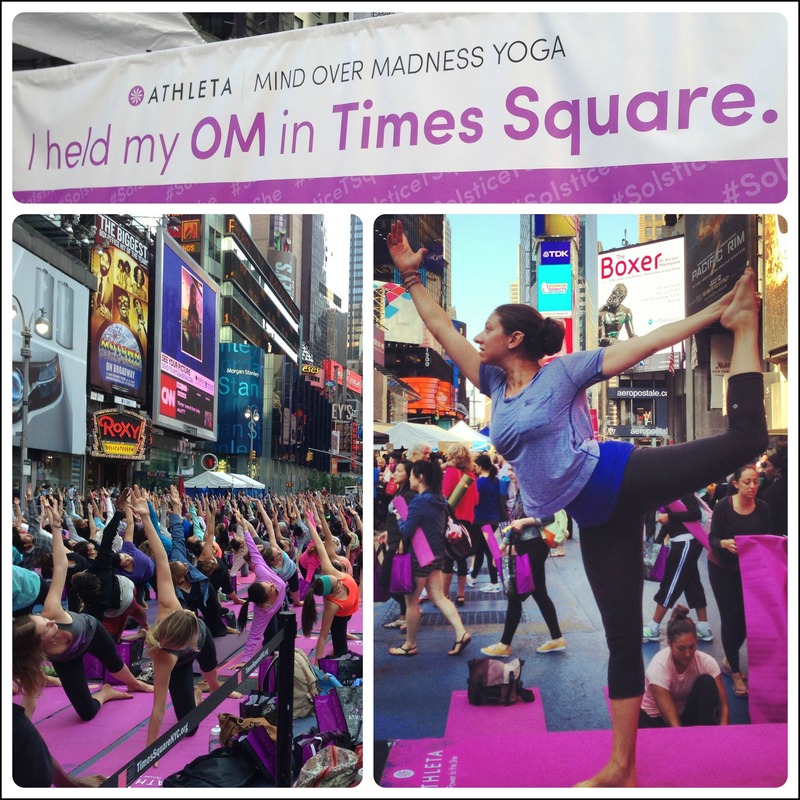 It was loud, overwhelming and incredibly crowded – yes ladies and gentlemen, I did yoga in the middle of Times Square! 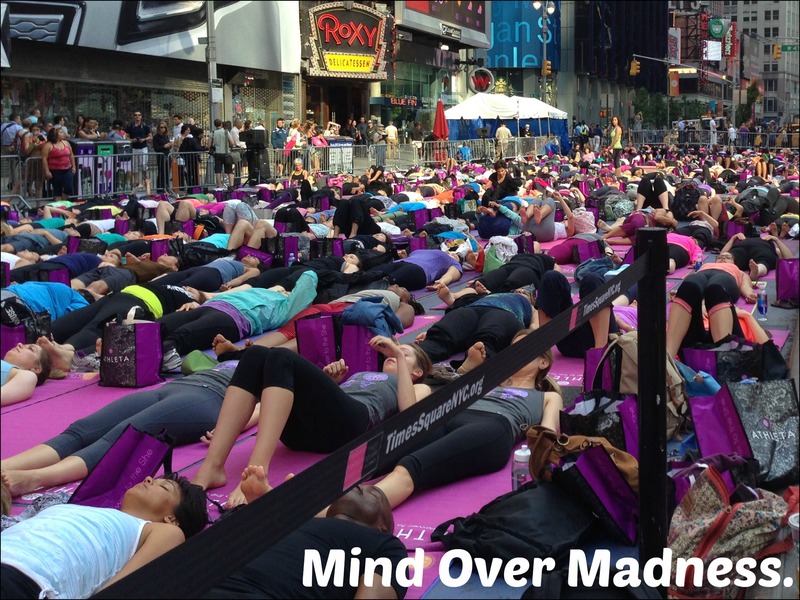 But once I read the event tagline, “Mind Over Madness”, I totally got it and immediately wanted to check it out. In yoga we’re constantly trying to focus on being present while practicing and not letting our minds wander to other things. 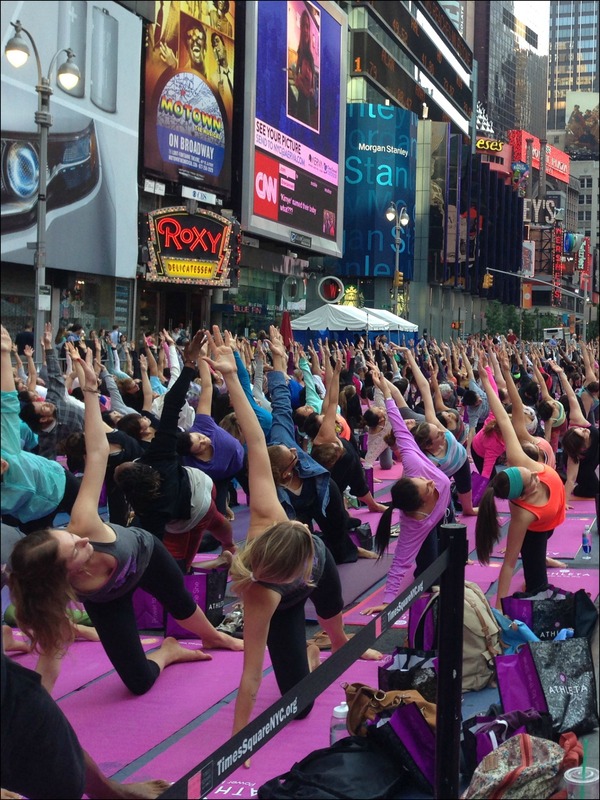 Being present and not just going through the motions during yoga is something I used to struggle with, but I really feel I’ve come a long way and what better test than to practice in the middle of honking cars, jackhammering and thousands of tourists and New York City commuters! I arrived bright and early for the 7:30am class I had pre-registered for and managed to grab a great spot right up front by the stage! 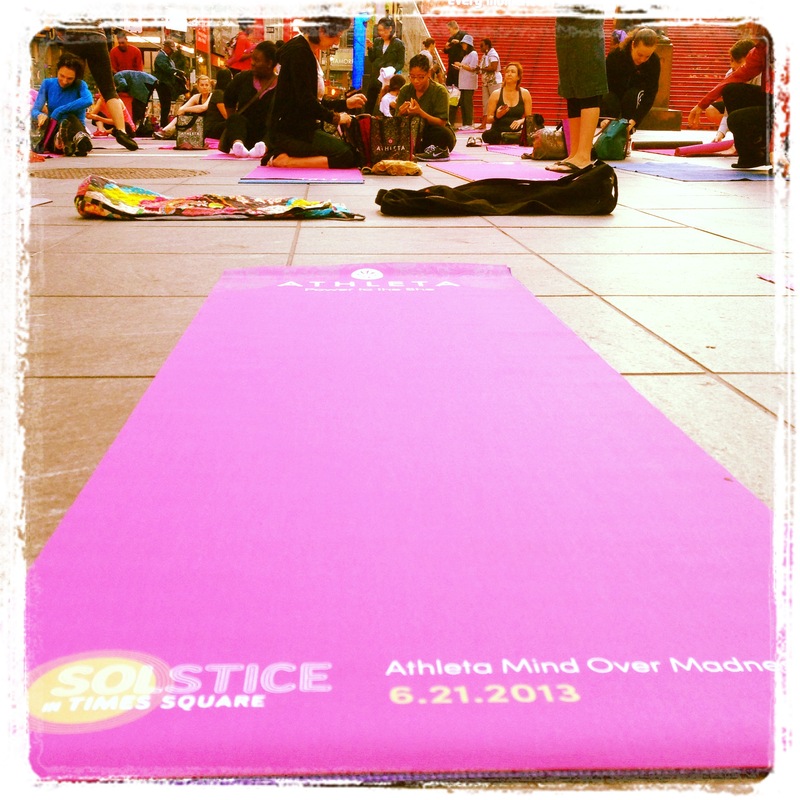 free yoga mat and bag of sponsor samples! …and the practice was led by San Diego yoga teacher and Athleta model Drisana Carey (pictured above behind Tao Porchon-Lynch in the yellow). The practice only lasted about 45 minutes (due to a late start because of some technical issues), but what an amazing experience! I was amazed at how little I noticed everything that was going on around me and how present I was in the practice, a true test that mind can overcome madness! I am so stinking jealous!!! I’m glad I went, it was definitely a cool experience! Yeah for us spreading the love all the way to Nebraska! Definitely was, glad I decided to go! Looks like it was a lot of fun Danielle. Love the photos!! Wow…..that practice looked amazing. I cannot imagine being able to keep your concentration in the middle of TImes Square. As a relatively new yoga student, I still have trouble with keeping my focus. Loved your photos, especially of the 94 year old yoga guru! Thanks Pam, it was definitely a good test of being present on my mat! What an amazing experience! Very cool. Yeah, I really need to take advantage or more of the cool things there are to do in the city. I’d like to try the outdoor yoga offered in Bryant Park sometime too, now that I’m not working in the city it’s a little harder though. I was just reading about that class! Is that the one sponsored by Athleta? Looks like it’s midweek. But I’ll keep my eye open for weekend stuff. I think the Lululemon near Lincoln Center does free Sunday morning yoga. Yup, the Bryant Park classes are sponsored by Athleta, I may try to go this Thursday. I have an unlimited membership to my yoga studio here on Long Island so I usually go into the city if it’s something unique – let me know if you hear of anything fun! Wish I had known… I would have come as your personal photographer. Yes, that was the same event! There were 4 or 5 classes throughout the day, it really was so cool to experience to experience that type of calmness in the middle of Times Square, who’d of thought! I’m so jealous! I wish I had known about this! Would have been a great way to start the day. I usually try to avoid Times Square like the plague (so glad I work downtown, I could not handle midtown), but this seems like it was an fantastic reason for making an exception! Good for you for doing it! 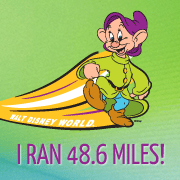 One year, I’m actually going to get to do it. Im so jealous! I would’ve rather been there instead of on a flight. Boo! Glad you had a good time!